There’s an article that gives some very stark details about the 250 million security cameras in existence throughout the world. 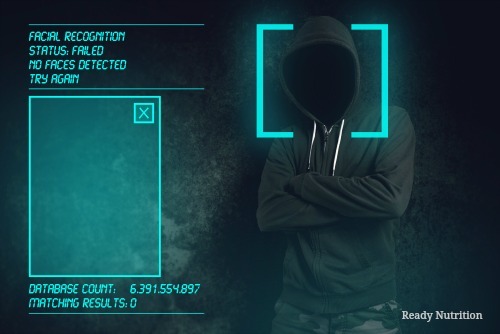 The article entitled “Opinion: Facial recognition will soon end your anonymity, ” written by Tarun Wadwha on 6/4/2016 explains this in detail and how new developments in software and the ever-growing number of cameras everywhere are reducing your chances to remain anonymous. Chances are that your face has already been scanned  and entered into a database without your knowledge. Knowing these things, there are a few measures that we can take…and these are directed toward urban and suburban dwellers to give them an edge. Another big problem to overcome with all of this surveillance is the fact that most people have their constantly clicking and snapping little phone-cameras to take pictures of every single thing on the planet within their “biome,” and it’s these individuals who serve as “silent witnesses” to help the surveillance state gather as much info as they can. In addition, let’s not forget that every photo you post, twitter, place on Facebook, or download in any capacity does indeed become “scarfed up” by the government. That $50-billion-dollar facility in Utah  wasn’t built to help out Olan Mills with their photography work. We are entering into a phase in our country with a moment of decision to come with the U.S. elections. Martial law  is always just around the corner, waiting to be inflicted on us. These are techniques you’ll have to incorporate into your daily routine and they’ll take some practice. Awareness and the ability to act on what is happening around you are the keys you’ll need to be able to make it all work. We’d like to hear any suggestions you have on the matter that may work for others. Keep fighting that good fight, and stay away from those cameras! JJ out!